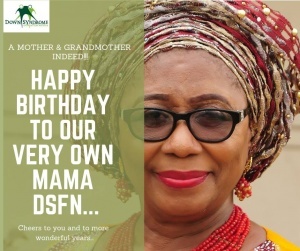 Today it is with great pleasure that we celebrate an awesome Special Needs Mum, an advocate for Persons living with Down syndrome and other disabilities, a role model, National President of DSFN, Chairperson of ADSN. Mrs. Rose Mordi, a devoted Mother and Grandmother like no other, her support and drive towards ensuring the rights of persons with Down syndrome/intellectual disabilities has seen great improvement in Nigeria, Africa and Worldwide. Please join us in praying for more of God’s blessings upon her life as she continues to do that which she does best, to the Glory of God!